Case Study Published By: Raritan Inc. 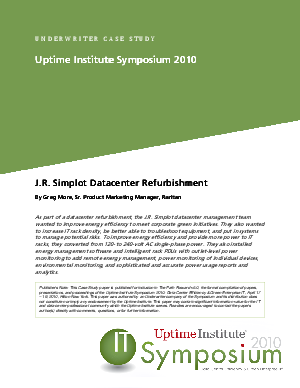 The J.R. Simplot data center management team wanted to improve energy efficiency to meet corporate green initiatives. They also wanted to increase IT rack density, be better able to troubleshoot equipment and put in systems to manage potential risks. This Case Study explores how they installed energy management software and intelligent rack PDUs with outlet-level power monitoring to add remote energy management, power monitoring of individual devices, environmental monitoring, and sophisticated and accurate power usage reports and analytics.